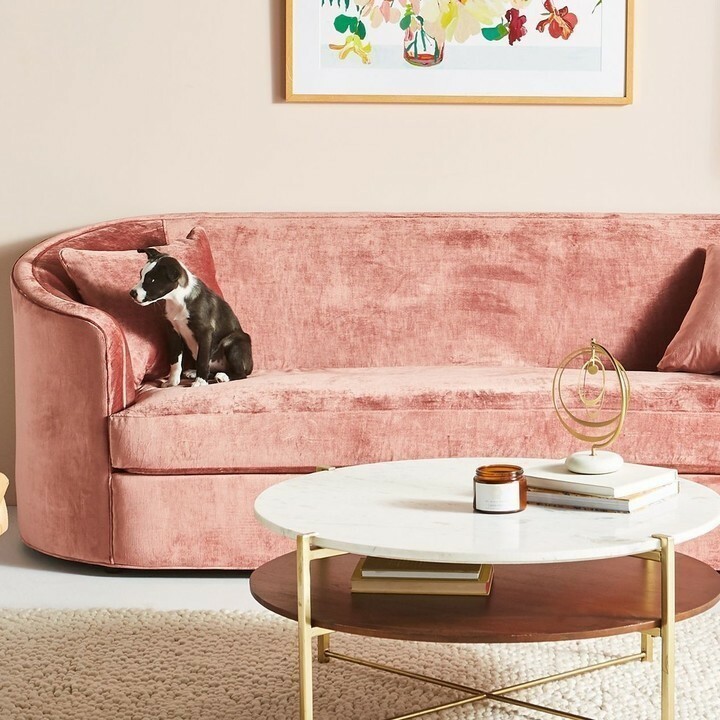 Brush up on your sofa styles and find the best couch for you — all 20 picks are gorgeous, comfortable, and fresh for 2019. Couch: Merriam-Webster defines the word as "an article of furniture for sitting or reclining." Yeah, that's accurate, but we'd define the word a little differently. A couch is a place where you'll unwind with a great book, binge-watch the newest season of your favorite show, and snuggle up next to someone you love — that includes your cat or dog. The best couches to buy in 2019 are so much more than just a place to sit. 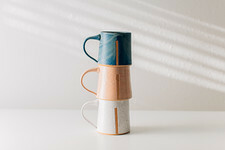 They're also a statement piece, a nod to your favorite design era, and a place where your guests can spend the night when it's snowing a little too hard. But before you dive head-first into into the shopping experience, there are a few things that require a little research. First thing's first: How big should your sofa be? Do yourself a favor — grab a tape measure and figure out the dimensions of your living room before you start looking at sofas. Square footage will drastically impact the style and size of your ideal couch, and if you narrow those things down now, it'll save you headaches (and maybe even heartaches) later on down the road. No one wants to fall in love with a couch only to realize it's not going to work in their space. Next, pinpoint your preferred style for your dream living room. Color-scheme is definitely worth considering, but since most couches these days come in dozens of different shades, it's not the most important factor. You're better off narrowing down the options with questions like, "What design style do I love?" and "What kind of sofa suits my needs?" If you entertain a lot, the best sleeper sofas are great for those guests who spend the night. 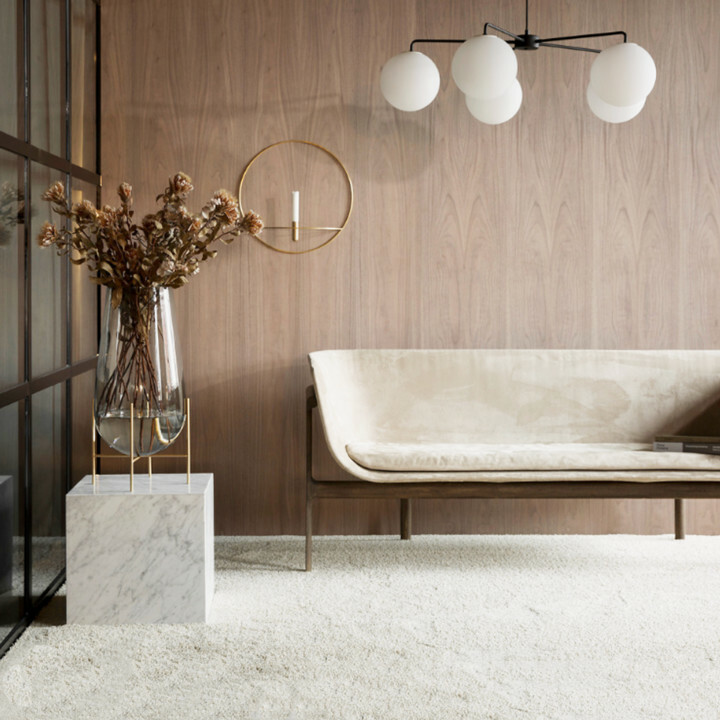 If you love functional, minimalist rooms, a mid-century modern couch will optimize your space and contribute to the clean style. Huge family? Sectionals are your best bet. If you're starting to feel a little bit overwhelmed, don't worry — we've broken everything down into specific categories, so keep reading to figure out which couch is best for you. At first glance, all couches might seem pretty similar— four legs, some padding, and two arm rests (sometimes). That being said, there are actually dozens of different sofa styles, and brushing up on your terminology could help you immensely in your search for the perfect couch. The design you choose will likely determine the couch's general size, function, and ideal placement in your home, so it's definitely worth considering before you pull out your credit card. These are 20 of the most popular sofa styles available in most stores, as well as a recommendation for each category. 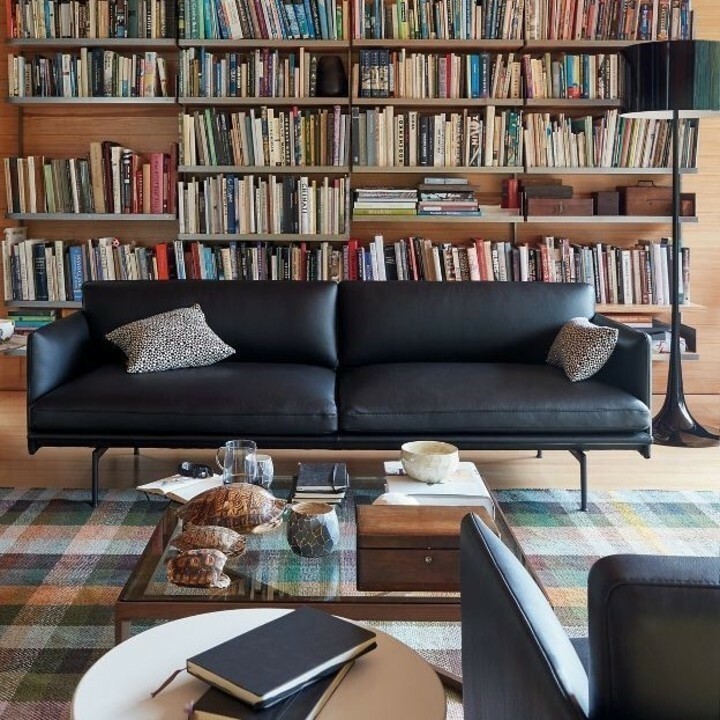 It's also important to note that while there is a general category for every couch, most come in loads of different designs, and oftentimes the characteristics do overlap — so feel free to mix and match the features as you see fit. Because of its timeless design and comfy, overstuffed feel, the Lawson-style couch is one of the most popular options right now. It's characterized by low arms, a deeper seat, and large back pillows, but perhaps the most notable feature is the removable cushions. Not only can you readjust them to optimize your comfort levels, but it's also a practical choice for families with children and pets. Since the cushions aren't attached, they're easy to vacuum, spot clean, and shake out. Sometimes you can even remove the covers entirely so you can throw them in the washing machine. 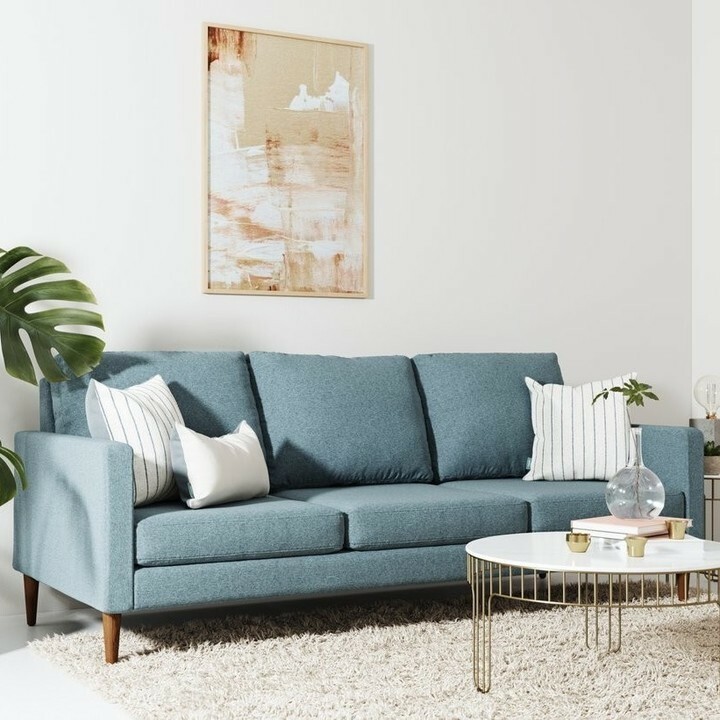 The Campaign modern sofa is one of the best Lawson-style couches out there for 2019. It has the signature low arms and large removable cushions in a mid-century modern design that reviewers love — enough to have given it an unbelievable 4.8-star rating. You can get this couch in 17 different brushed-weave colors and you can even customize the wooden legs, but the interior is just as noteworthy as the exterior. With high-resilience foam, a steel frame, and hardwood accents, this one is made for long-term durability. This one is another very popular choice because it's affordable, versatile, and practical. A Bridgewater sofa is also known as a birch-arm or English three-seater, and it typically has looser padded cushions and a slightly-rolled back. The arms are also rolled, and set back a little from the foot of the couch, which often gives it a more traditional style. This couch isn't necessarily going to be a statement piece, but it will effortlessly blend in with existing decor and make for a very comfortable Netflix-watching spot. Even though it has the rounded corners and rolled, set-back arms, the Laurel Foundry Rosewater sofa is more modern than most other couches in this category. Its linen-like material, visible wooden legs, and contrast stitching give it a contemporary feel, so you can enjoy comfort and style simultaneously. And speaking of comfort, this sofa is injected with a special gel foam, which not only makes for a thick, supportive cushion, but it'll also keep you cooler in the summer months. Characterized by sleek lines, minimalist design aspects, and bold colors, mid-century modern pieces are extremely popular right now. These retro-inspired sofas are modeled after design elements from the mid-1930s to the mid-1960s, when geometry was very in, so you'll usually find clean, rectangular shapes and aesthetically-pleasing symmetry. They're also usually lower to the ground and have a Scandinavian-inspired feel that subscribes to the "less is more" mindset. 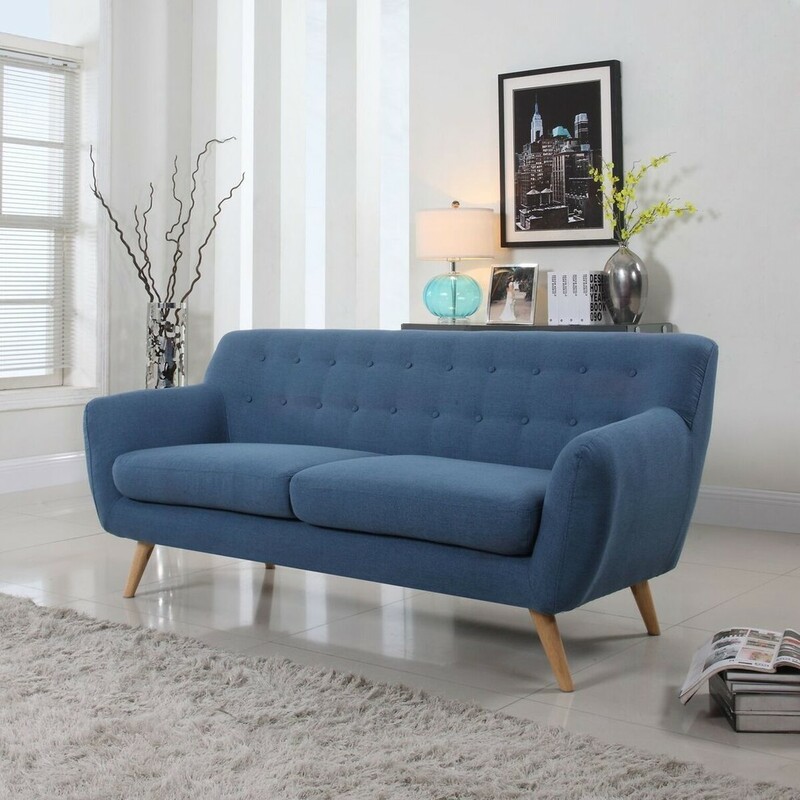 Built with a hardwood frame and solid wood legs, the Divana Roma mid-century modern sofa has all the characteristics described above. It also has a Chesterfield backrest (more on that style soon) which helps to warm up the style and gives the eye something to focus on. As for buyer feedback, reviewers have given it a 4.6-star rating. They "love the smooth lines and mellow color of this sofa," and say it adds a "touch a sophistication to any space." You can get this one in nine different colors, including bold magenta, bright red, and even gray with rainbow buttons. This one is a bit more vague, as it's categorized by an ever-shifting style rather than specific design elements — but contemporary sofas today often utilize natural textiles, neutral colors, and minimalist, spacious designs. 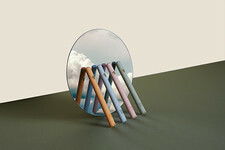 In other words, it's subject to change, as "modern" furniture really just describes anything that's on-trend right now. That being said, since simplistic shapes and Scandinavian decor are particularly popular right now, most contemporary couches fit into those classifications. 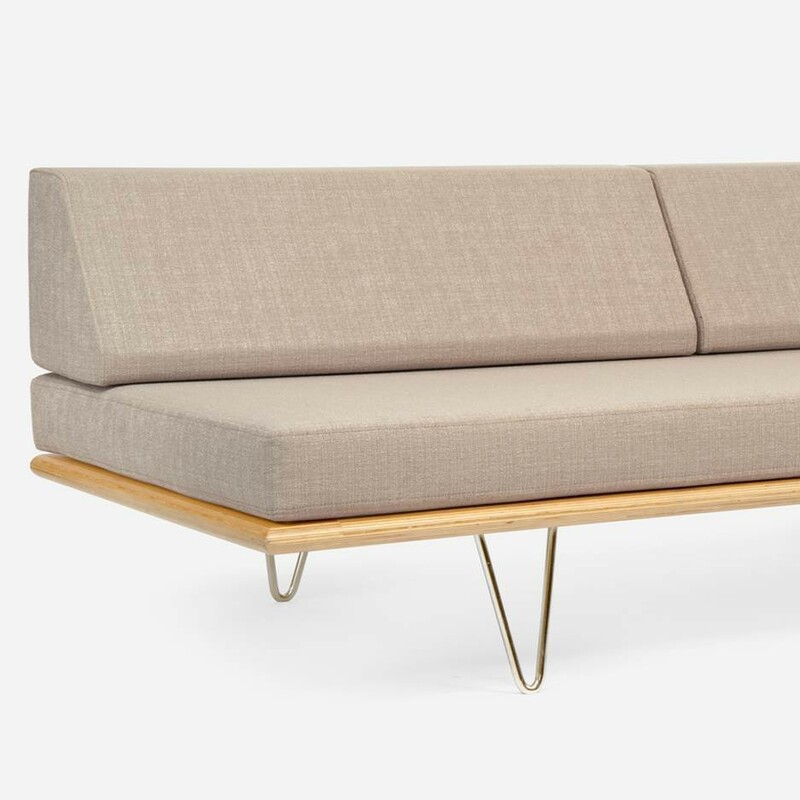 The Outline sofa, for example, sits low to the ground and takes elegant cues from modern architecture. It has low arms and a wide seat to optimize space, and its powder-coated aluminum legs and solid-color upholstery give it a current feel. You can even customize your material of choice (fabric or leather), and choose between three colors in each category. Love seats come in all different designs — that's because the qualification for this category has to do with size, not style. Whereas most couches can fit three people at a time, loveseats can fit one or two. They range from 52 inches to 71 inches in length, and are great for small living areas, end-of-bed seating, and to compliment a regular-sized sofa. Since they're smaller, they're usually also more affordable. 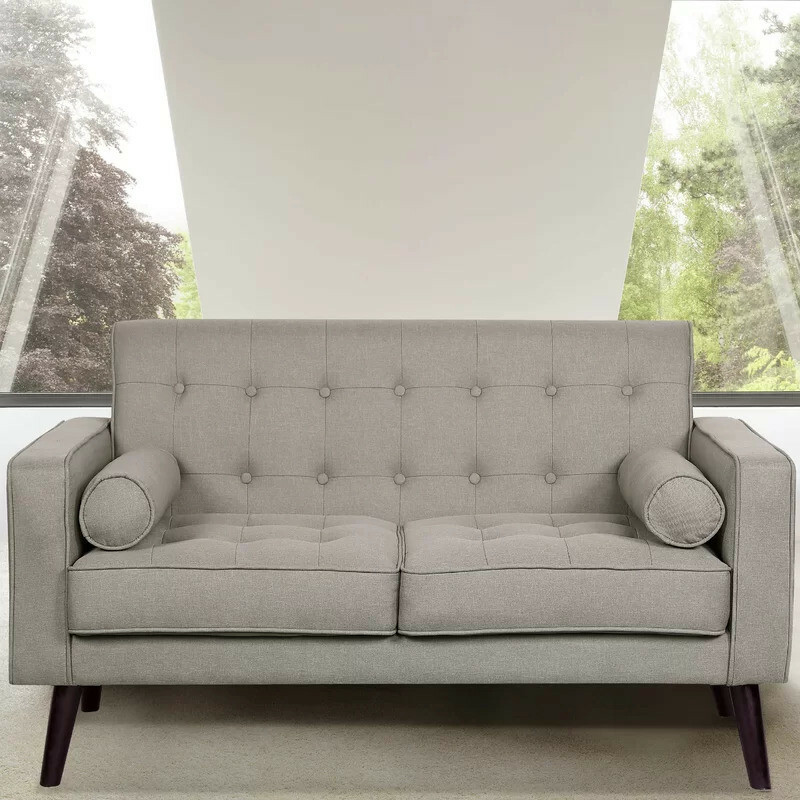 Available in five different colors, the Morre loveseat from Zipcode Design has slanted legs, boxy angles, and a button-tufted textile for a mid-century look. The two rounded bolster cushions warm up the style without taking up too much room, and the foam-filled cushions give it a medium-firm feel for those who prefer some structure. This design has well over 300 reviews, and is a favorite among those who live in small studio apartments. Pretty much the exact opposite of the contemporary couch, the Camelback sofa is defined by its curves and high, traditional-looking back. In fact, it's the high back that qualifies it for this category. Like a camel, it reaches its peak near the center. Oftentimes, Camelback sofas also have tight upholstery, bench-like wooden legs, and Chesterfield tufts — but they don't necessarily have to. Due to its antique style, it's not easy to find a modern Camelback, but this Pittsford sofa comes pretty close. Instead of tufts and tight upholstery, it features a velvet-like fabric, two distinct seat cushions, and nail head trim that contrasts the dark material. That being said, the curves and high back give it a traditional, almost castle-like design. People who have seen it in person call this style "elegant," "classy," and "high-quality." This is another one that commonly overlaps with other styles and designs. That's because the determining factor for a Chesterfield is the tufted buttons, which give the fabric a quilt-like appearance. The tufts can be present on the arms, seat, and back, or just one of the aforementioned, but as long as they're present at all, it'll qualify as a Chesterfield. Some sources say the first design for this couch was commissioned by Lord Philip Stanhope (the fourth Earl of Chesterfield), because he wanted a couch that wouldn't cause his clothes to wrinkle. Other sources say that's likely just a myth, as tufting like this didn't emerge until the 19th century, but either way, this style gives an elegant feel to any room. The trademark feature for the Cabriole is the design of the arms and back. Both are virtually the same height and round in towards the center in the front. For that reason, they have a retro-style feel that you can use to reinvent your entire space. While more traditional ones have wooden frames that can give them an upscale but somewhat-stiff impression, more modern ones can be comfortable, laid-back, and a great place for a nap. For example, the Vera sofa from Anthropologie is entirely covered with a soft, homey upholstery. Since it's a custom piece, you can choose between regular velvet or slub velvet for a shinier, more retro look — and each category has more than a dozen colors to choose from. It also comes with two matching throw pillows to boost the comfort-factor even more. English rolled-arm sofas have been around for centuries, and judging by their current popularity, they're not leaving anytime soon. They're recognized by their extremely low arms, which (you guessed it) roll out toward the sides. They also typically have tighter upholstery. These two features combined usually make for a more traditional look, but since the general style, shape, and legs don't have to fit any particular specifications, you can find an English sofa that's more modern-looking. 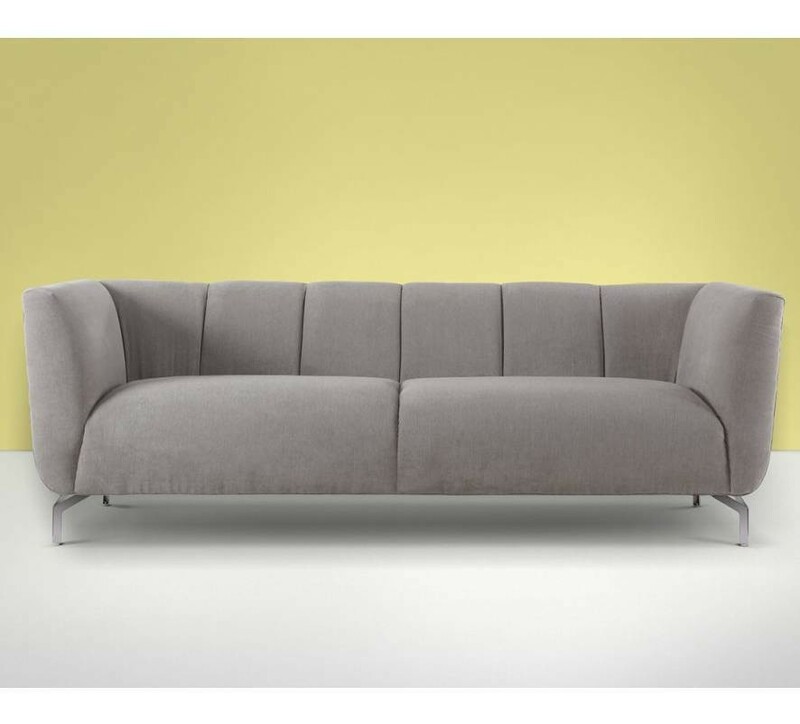 Here's a great example: the Buxton sofa, which contrasts low, rolled arms against contemporary textiles and squared legs. The upholstery is made from a linen-polyester blend, and is available in four colors — matching throw pillows included. 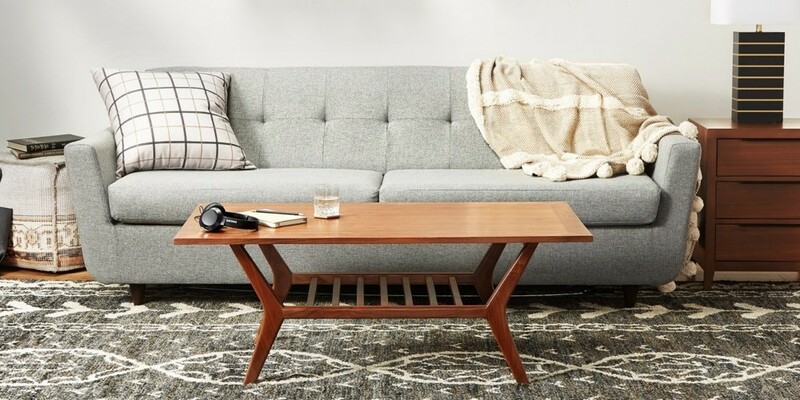 It's technically not a loveseat (because it measures 73 inches instead of 71), but since it's both cozy and compact, it's a great way to add a charming touch to a tight living space. Yet another antique-inspired design, the Divan is derived from the Persian word meaning,“room where the office or tribunal sits." In other words, it's a piece of furniture meant for sitting — but the style has come to describe a backless, bench-like sofa that that best suits the space when it's pushed up against a wall. For that reason, it's not the most comfortable choice for living rooms, but it'll look amazing in a dramatic entryway or a contemporary dining room. 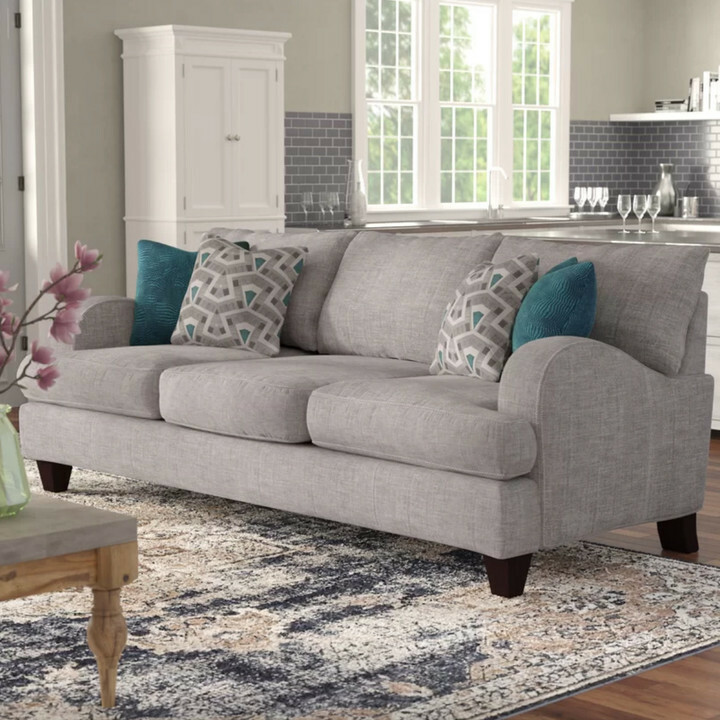 The Cunniff sofa from Mercury Row works in both those settings, but it'll also complete a cozy nap nook or provide some sitting space in a bedroom or office. On the exterior, you'll find neutral linen with matching bolster pillows, and inside, there's a solid rubberwood frame. Note that it doesn't come with the cushion because the style technically overlaps with a daybed, but any standard twin mattress will fit. Reviewers say it "[exceeds] expectations" because it's "easy to assemble, sturdy, and sleek." A Tuxedo couch is similar to the Cabriole in that the arms and back are equal in height. However, instead of a rounded backrest that curves toward the center, this sofa is boxy in every aspect. It has a square frame, square arms, and a square back, so you'll find 90-degree angles pretty much everywhere you look. The style arose in the 1920s, and is now a great fit for upscale spaces and glamorous, retro-inspired homes. With its tufted shelter-style back, polished metal legs, and low seat, the Sandy Wilson Tuxedo gives a nod to mid-century modernism, but its chenille upholstery is still warm and inviting. This pick is available in midnight blue or silver gray. The terms "sofa" and "couch" fall a bit short with this one — but the settee is worth mentioning anyway due to its size and practicality-factor. Because of its high legs, straight back, and slim profile, this style is actually more like a bench than anything else. It’s not ideal for a living room because of its firmness level, but it works well in an entryway or at the foot of a bed — especially when you're tight on space. Created by Portuguese designer Rui Alves, the Tailor lounge sofa was inspired by authenticity and designed to create a light, airy environment. 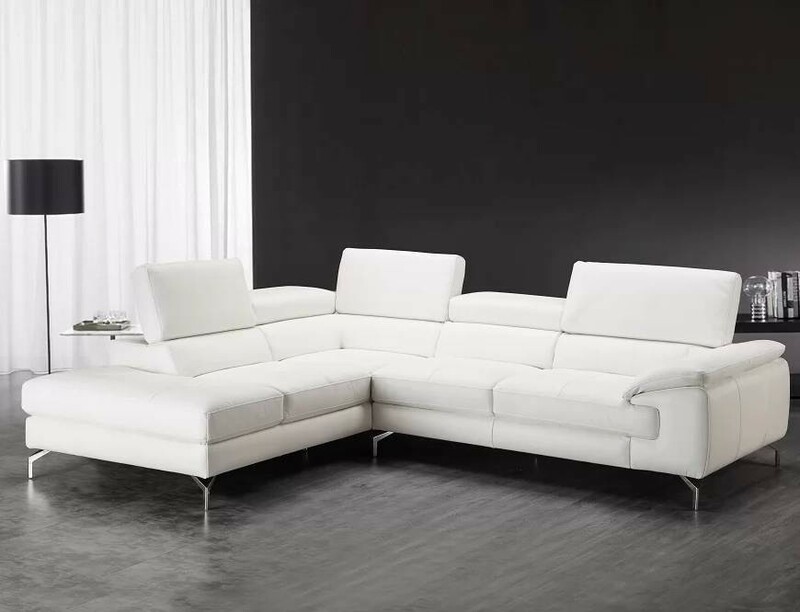 Its genuine-wood frame is entirely visible, and the softly-cushioned upholstery offers structure alongside comfort. Most importantly, this settee has an especially sleek profile, so you don't have to worry about bulky arms or space-consuming cushions; this one will fit just about anywhere. The reclining sofa is exactly what it sounds like — a sofa that reclines. Technically, any couch with a built-in adjustable mechanism will qualify, including those with manual handles, hinging backs, and movable headrests. But the popularity of power-recliners has been on the rise for years due to advancements in technology. They're a favorite among consumers because they're easy to optimize for comfort. Needless to say, they've become a staple in at-home media rooms and more-casual living areas. Most reclining sofas are pretty bulky (all those mechanisms have to fit somewhere), but the Orren Ellis Nakale loveseat seemingly achieves the impossible. Yes, it's extremely sleek and compact, but this loveseat sofa features push-power reclining capabilities, extending footrests, and adjustable headrests. It's covered in premium Italian leather, and has black metal legs that'll mesh with any decor. (If you're interested in seeing more styles of reclining sofas, check out this article here LINK TK). In French, the term"chaise lounge" essentially translates to "long chair," which is pretty accurate. This style is a blend between a chair and a daybed, and the design is so old, there's actually ancient Greek art that depicts goddesses lounging on it. While the term usually refers to a single chair, it can be extended to any piece of furniture that includes a longer cushion to support the legs, so you can relax and put your feet up without the need for an ottoman. The Burrow Chaise Lounge sofa is one of those pieces. Its design includes the modern sofa that "the internet can't stop talking about," but on the left side, you'll find an extended chaise for optimized relaxation. 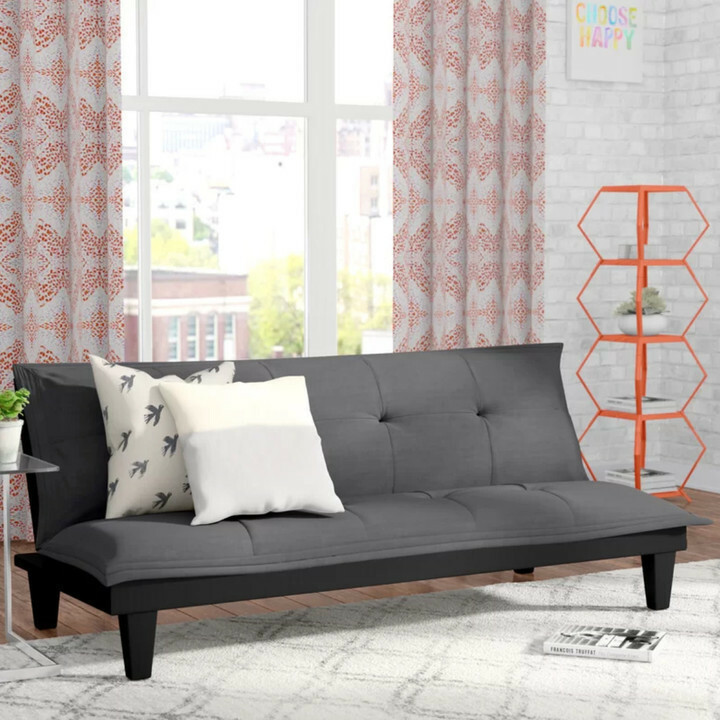 If you'd prefer the chaise on the right side, you can customize that — in fact, almost everything about this couch is customizable, including the fabric color, arm height, and wood tone for the legs. Reviewers call it "the perfect couch for a real life home" because it's "timeless yet super comfy." 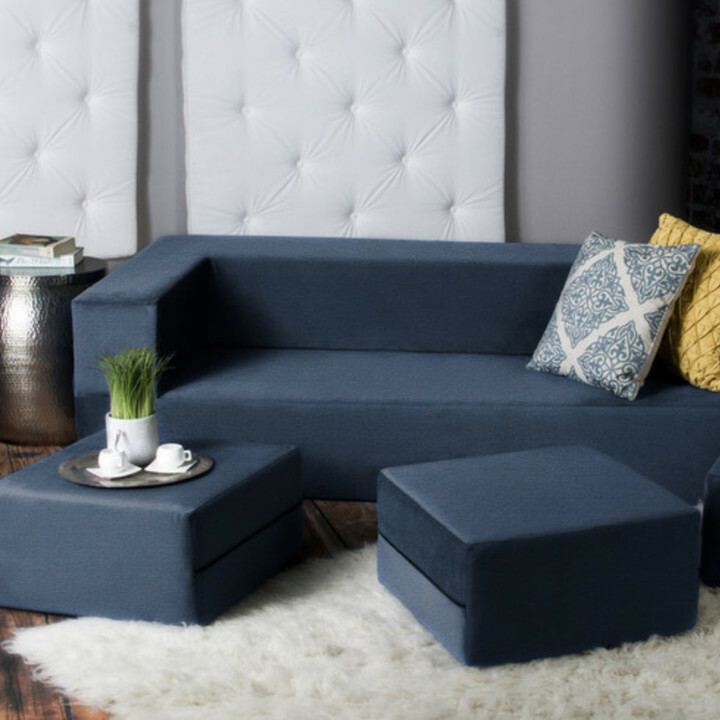 Typically just referred to as a "sectional," this sofa is comprised of at least two attached pieces that form an L-shape. Sometimes, there's a third piece on the other end to create a U, but so long as it forms at least one 90-degree angle, it fits into this category. 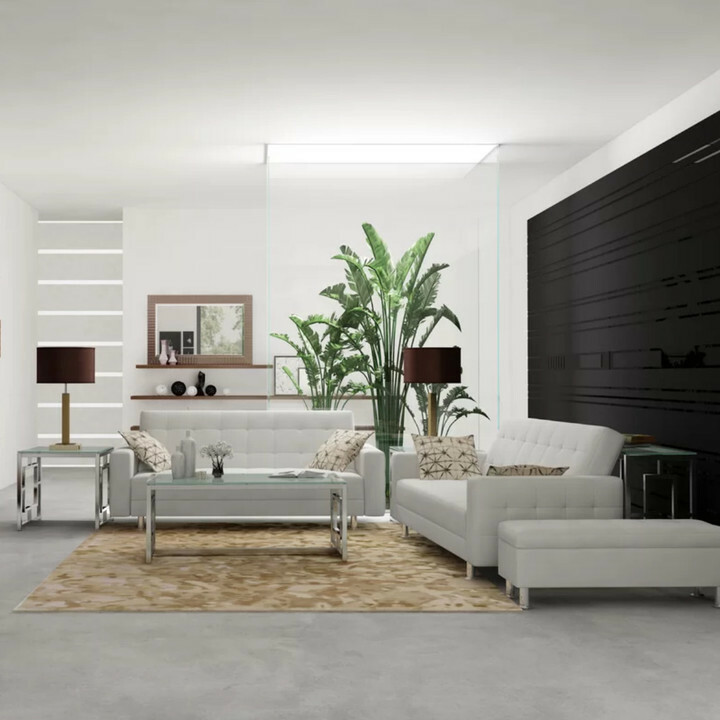 If you're caught between a traditional sofa versus a sectional, style, family size, and footprint are all things worth considering. Typically, a sectional means more lounging room, which is better for bigger families and larger spaces. They're also great if you have an empty corner that you don't know what to do with. 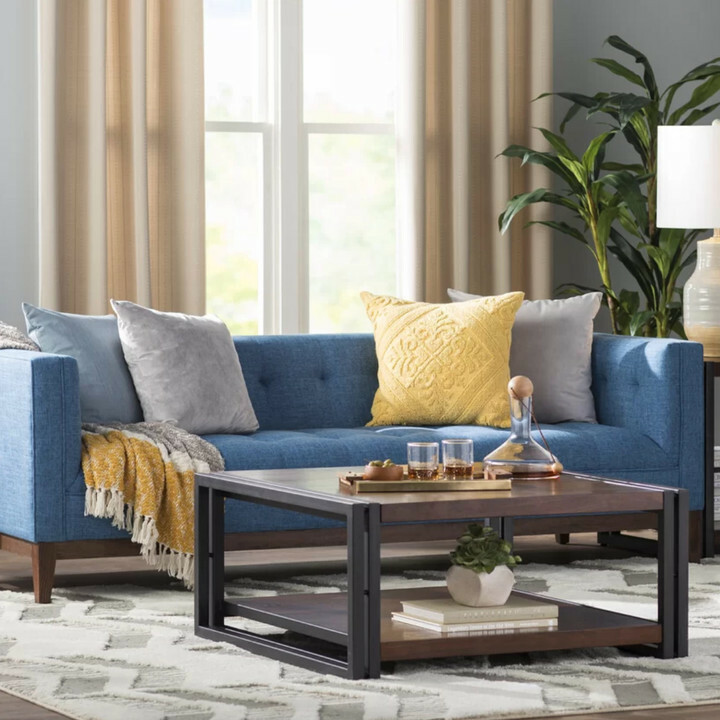 The Atalaya sectional is a moderately-sized option that works well for most spaces — especially because it's offered in both a left-hand- and a ride-hand-facing orientation. It's crafted from premium Italian leather and has five ratchet headrests so each individual can personalize their lounging angle. Last but definitely not least, the foam-fill seats and metal legs come together to create a combination of style and comfort. No wonder this piece has a 4.9-star rating. Very similar to chaises and divans, daybeds are a cross between a couch and a bed and are ideal for lounging. The main difference? Most are half- or primarily-encompassed with railings, arm rests, or back rests. Some also require twin-sized mattresses. For that reason, they have a much more casual feel, and work better in private offices or bedrooms rather than more-public living spaces. 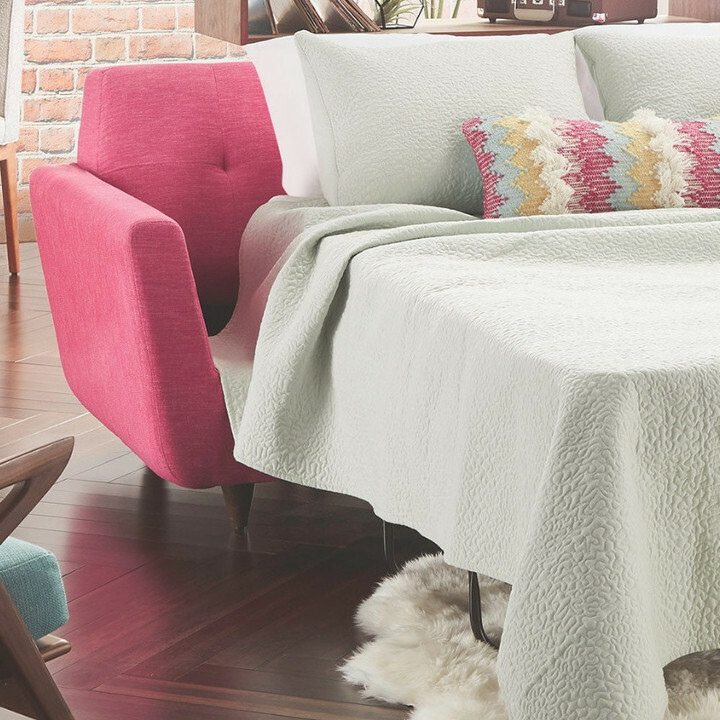 Since they're multi-functional, however, you can style a daybed virtually any way you want so it can best suit your needs. 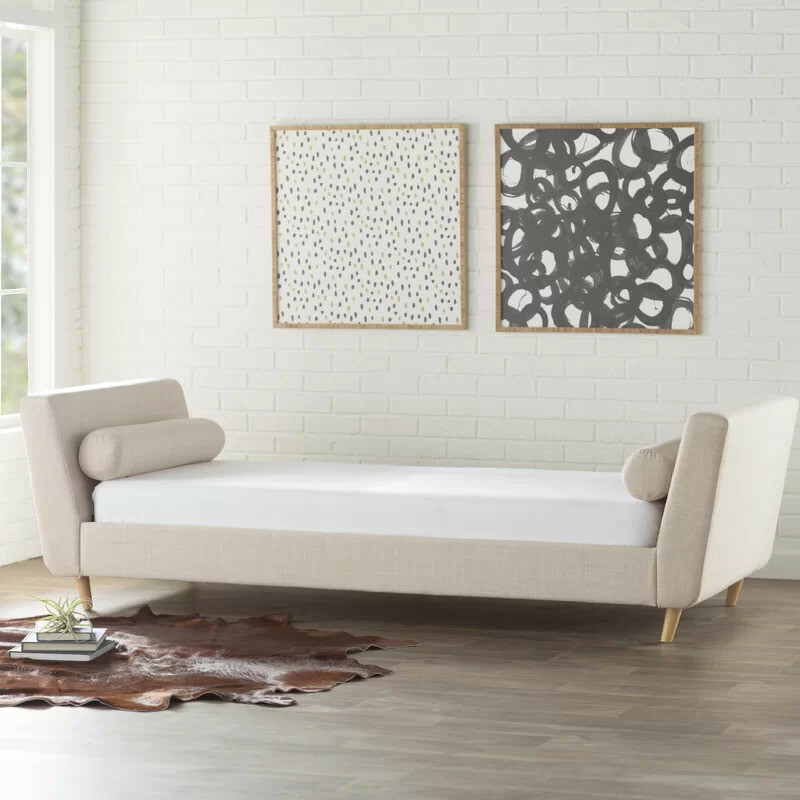 When it comes to this Modernica daybed, you don't have to worry about purchasing an additional mattress. It's hand-crafted with a cushion that has metal springs built into the platform for support and bounce — and the canvas cover is removable for washing. 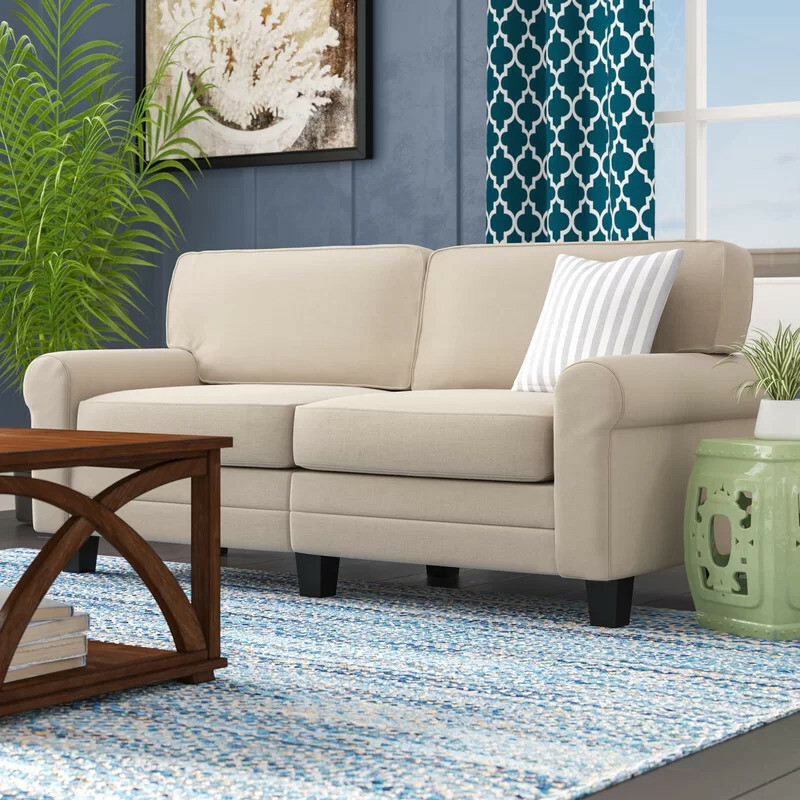 This pick also features modern V-shaped metal legs, a wooden frame in four different stains, 22 different color options for upholstery, and a modular design that you can add onto in the future. At first glance, a sofa bed looks just like your average couch — but when your guest has a little bit too much to drink, this is the style you want to have. That's because the back reclines or folds down flat to provide more room for sleeping, transforming it into an impromptu mattress. It's also great for naps, reading nooks, and spaces that double as an office and guest bedroom. 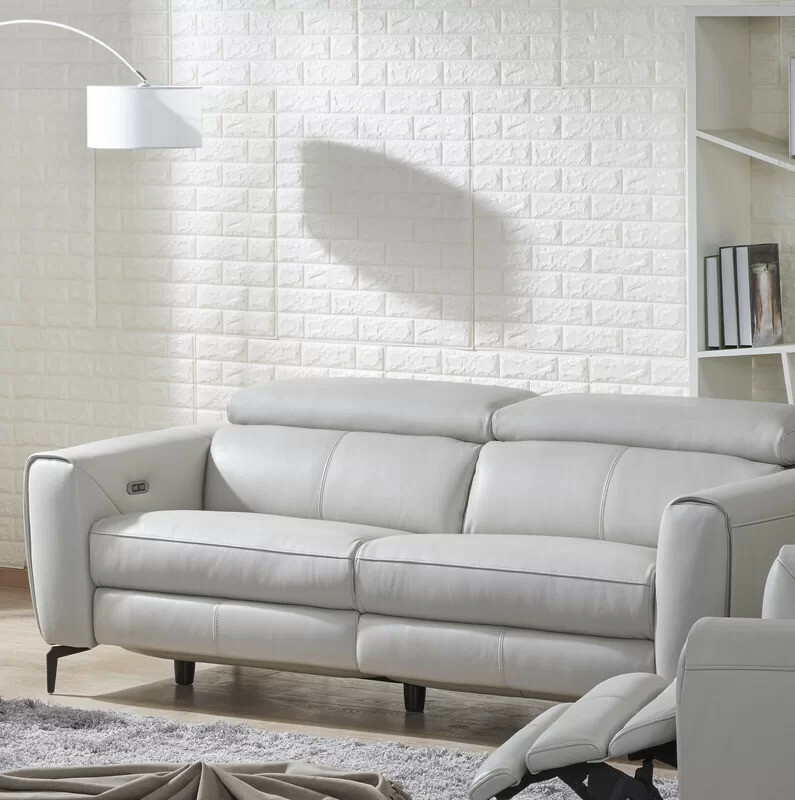 With its boxy silhouette, tufted material, and white faux-leather upholstery, the Spirit Lake sofa bed is as modern as they come. It also has cylindrical metal legs and a European-inspired feel that make reviewers say, "I could not be happier with this purchase! Exactly what I needed for my home office." Even though it's priced under $150, the Bane futon still has class — and it comes with a micro-suede cushion, which isn't always the case. The base is durable, the frame is easy to adjust, and the legs have a contemporary look and color. This pick is also extremely easy to assemble and comes in black, gray, or brown, too. As previously discussed, a sleeper sofa — also known as a pull-out couch — has a mattress built into its design. (It's not the same thing as a sofa bed, which simply folds down flat.) For this pick, all you have to do is remove the cushions and pull the handle, and an actual mattress will pop out and unfold until you have a real bed. Since most options come with the mattress, these sofas are often more expensive than other categories — but if you have house guests, college-age kids, or no spare bedrooms, it's definitely worth the splurge. The Hughes sleeper has extremely high reviews for a multitude of reasons. For one, it's so sleek and minimalist, you'd never guess that there's a mattress crammed in there (but there is, and it's memory foam.) For another, it's available in multiple fabric finishes, including pet-friendly and safeguard, and each category has tons of colors to choose from. You also get to customize the stain on the wooden feet, and finally, people cannot stop raving about how comfortable it is — both in couch form and in bed form. Finally, there's the convertible sofa, which utilizes an out-of-the-box design so you can get the most out of your living area. This category includes any couch that transforms into something else using adjustable mechanisms or adaptive pieces. Sofa beds and futons are included here, and you'll likely see them marketed as such. However, they're not the only form of convertible sofa. There are loads of other creative designs that utilize space and materials in brilliant ways. Take, for example, the Zipline convertible sofa. It may look like a laid-back, comfy couch that's well-suited for an apartment or hangout space — and it is. But its three square ottomans can also be stacked to form a side table or wedged between the couch arms to save space. If you have overnight guests, the ottomans fit on top of the seat and the couch splits down the middle to lie flat like an air-mattress. It's available in eight different colors, and the fabric is entirely removable and machine-washable. We hope you found the couch of your dreams! So you know, Lonny may collect a share of sales from the links on this page.